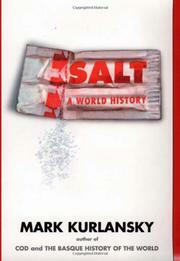 A lively social history that does for salt what Kurlansky previously did for Cod (1997). Perhaps the author slightly oversells his subject by claiming it is far more important and interesting than the evolution of language or the harnessing of fire. But maybe he has a point: Without salt, Kurlansky states at the outset, there would be no life, let alone a nifty preservative for everything from herring to mummies. Salt keeps the muscles pumping, the blood flowing, the brain firing. Its importance has trailed endless strife. Salt enters written history (as so many things do) with the Chinese, who had the first known salt works, imposed the first known salt tax, and fought the first known salt war. They also used it to preserve the wondrous 1,000-year-old egg, which “takes about 100 days to make, and will keep for another 100 days”—give or take, evidently, 365,000 days. From there Kurlansky follows salt through its deployment by the Egyptians on to the Basques, who salted the cod that they chased all the way to North America a thousand years ago, and on through essentially all of history. In salt, politics and food mix continually, if uncomfortably. The Incans, Aztecs, and Mayans rose to power partly on the back of salt; control of it made and unmade royal houses in Europe and the Far East. There developed a whole semiotics of salt, and Kurlansky deconstructs it. A couple of curious errors, such as attributing the famous comment “Kill them all. God knows his own” to “an Albigensian leader” rather than to the Albigensian-slaughtering Pope Innocent III, are piddling in relation to the study’s encyclopedic brilliance. Numerous old salt-specializing recipes are included. Enlightening and delighting as he goes, Kurlansky is, like Jane Grigson before him, a peerless food historian.